Welcome to day #2 of the MCT Sneak Peek release! I am so excited about this release! These stamps can really be added to anything!!! I am in love with Emma's background stamps! We are showcasing the Chicken Wire and Flower Background set..This set can be used in so many ways..For my project, I used this set to stamp my tags in my mini album. I used the Graphic 45 Once Upon a Springtime Collection with this set! It went perfect with the Spring time theme!! I just love how the album turned out!! My album is made out of recycled cereal boxes..For my blue flower, I used the Scallop and Stitched Circle Die Set. Its made out of Melissa Frances Crepe Paper! LOVE IT!! Behind the bunny I added a cute little egg using the Hello Spring set. I love how chunky this album is!! I tucked my tags inside the allbum..I made them using the XL label Die. Here is a closer look at the my tags..I used the Chicken Wire and Flower Background. I then distressed them using Tim Holz vintage photo. I used the egg die from Happy Hunting to make more tags. How cute are these!! I made a small tag book for more journaling..
Can you see the small eggs tucked behing the flowers? Yep..more tags!! Here's a closer look a the tags..
With all of our Sneak Peek Weeks, Emma likes to do some FUN giveaways! All you have to do is leave comments on our blogs. You do NOT have to comment on every blog, BUT if you do, you will just have more chances to win! ***SPREAD THE WORD TO THE WORLD ON FACEBOOK about this release & whatever connections you may have! 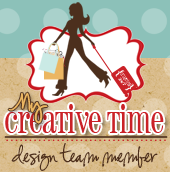 Let us know on "My Creative Time's" FB page here that you did so. OR you can just tag Emma in your post! Emma will randomly pick & announce all winners on Thursday, Feb. 16th during this AWESOME release happening @ 12:01 am PST in her video! GOOD LUCK!! Log onto your facebook now & let's start spreading the word! Nancy ~ OH MY WORD! This is BEYOND BEAUTIFUL! All the details are just GORGEOUS! I can't even imagine how long this took you! I am with Shar! I LOVE the chunkiness too! Great job! Wow this is amazing!! I love the use of the stamps and the dies!! I'm speechless (and for me, that's saying a lot!) Gorgeous! Absolutely gorgeous, love all the beautiful elements. What an amazing job you did!! I love the whole mini and all the details you added! So so gorgeous. I love all the colors and flowers. Just adorable. Totally awesome. The WOW factor for sure. Beautiful mini...I absolutely love it!! The details are amazing!! Wow! This mini is fabulous and gorgeous!! I love how you used Miss Emma's stamps in it! This mini album is great. Great way to show the new stamps. Fantastic mini album! I love it! What a great way to finish your mini. Looks amazing. Ummm...WOW!!! Look at all that detail in this album. It's fantastic! Great sneaky peeks too! Great job!! What an amazing mini. I love all the elements you used. Wonderful job showcasing her products. Thanks for sharing. Wow ... This is a beautiful mini album!!! gorgeous! :) Thanks for sharing!! What a super mini album...very chunky and I like how you are using the XL die for tags...great job! this album is beautiful! you did a phenomenal job! What a beautiful way to recycle cereal boxes. Wow! Amazing! Such detail. Thanks for sharing. WOW! That is a lot of work! WOW! Amazing, I love your mini, the colors you choose, the paper, and all the extra detail you added with tags and emblishments. Lovely job, I so want to try making a mini but im a little intimidated:)lol. Peace, Love & Cricut Hug's! WOW! WOW! WOW! WOW! WOW! WOW! WOW! WOW! WOW! WOW! WOW! WOW! WOW! WOW! WOW! WOW! WOW! WOW! WOW! WOW! WOW! WOW! WOW! WOW! That's all I can say my friend...WOW! Oh my goodness, that is so beautiful and springlike! You did an amazing job!!!! SO inspiring!